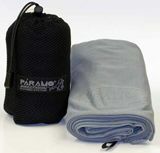 We have all the Paramo accessories including travel towels, caps, balaclavas and gaiters. The Paramo Waterproof Cap and Balaclava are the most popular items at this time of the year. The Waterproof Cap is probably the most comfortable and competitive mountain cap available. New is the Paramo Beanie hat made from Parameta G fabric used in Grid Technic baselayer.